The gum tree shield bug. Photo: Warren Birchmore. 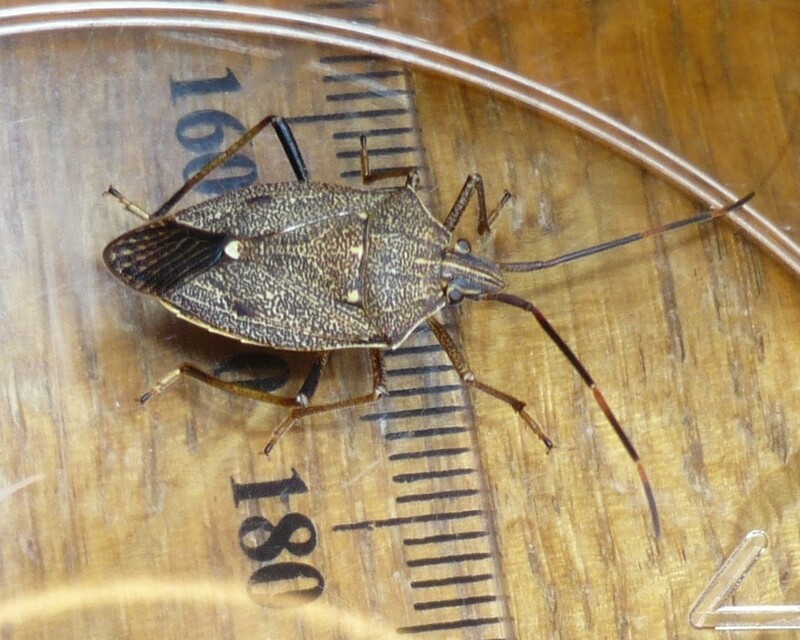 When a staff member walked into Warren Birchmore’s office with a suspicious looking bug on her jumper, Warren immediately thought of the brown marmorated stink bug (BMSB). “I was aware of the BMSB problem due to the recent publications and alerts, so I had heightened awareness,” Warren said, who is viticulture systems manager at Accolade Wines, based at Reynella. “When I pointed out the bug on her jumper, she instinctively flicked it off and it flew away. But I knew I needed to catch it for identification. I managed to catch it and contain it in a jar, which was hard to do as the bug was very active,” he said. The next step was finding information to assist with identifying the bug. Warren contacted Vinehealth Australia’s technical manager Suzanne McLoughlin. Together they identified some of the distinguishing features of the bugs that Warren could use to initially discount the bugs it was likely not to be. “Suzanne also suggested putting the bug in the fridge to slow it down, which was a great tip. Once the bug was sluggish, I put a ruler under the jar for scale, and took photos using the flash function,” Warren said. Monitoring is vital for best practice farm-gate hygiene. Photo: Vinehealth Australia. The markings on the bug and the number of antenna sections were also helpful in identification. Suzanne put Warren in touch with South Australian Research and Development Institute (SARDI) entomologist Greg Baker who was able to confirm that the stinkbug in question was a native gum tree shield bug. “It was a relief that our bug wasn’t the BMSB, which is exotic to Australia and we really don’t want it here,” Warren said. Warren says vineyard staff are key to monitoring for unusual pests, as they are looking at vines every day. 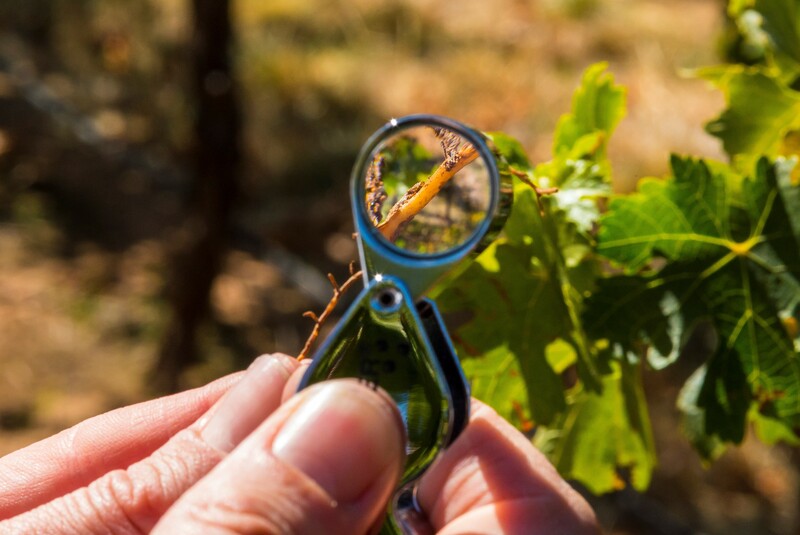 “Our vineyard managers are well versed in knowing what pests and diseases could appear and are always on the lookout for something unusual. If they do spot something, they immediately investigate it, either internally within Accolade or outside with organisations such as Vinehealth or SARDI,” he said. Suzanne said Vinehealth Australia was constantly looking at ways to make the pest and disease identification process easier for growers. “With new pest pressures on our doorstep, we’re focused on preventing the entry of exotic pests, as well as ensuring growers know what to do if they find something unusual. We’re here to help,” Suzanne said. If you think you’ve found an exotic pest or disease, call the Exotic Plant Pest Hotline on 1800 084 881.